Shine Your Light! 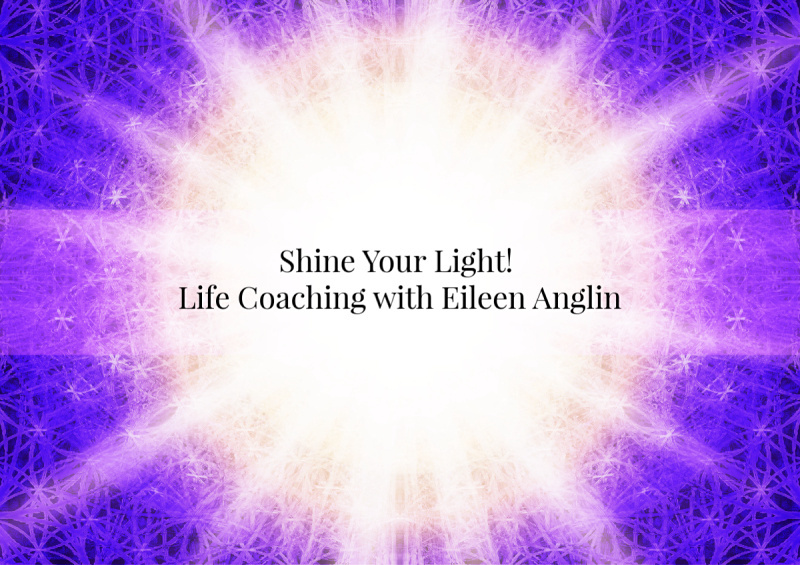 Life Coaching with Eileen Anglin — Shine Your Light! to live the life you were born to live. It’s time to shine your light. The world needs it. Life Coaching Sessions are one on one phone sessions that can transform your life. I work with people of all walks of life to break free of old negative patterns that keep them stuck. I also specialize in guiding creative people, actors, writers, artists, performers and anyone who wants to shine their light out into the world reclaim their self worth, work through fear and self doubt to live the life they were born to live. Life Coaching Sessions – one on one sessions that can transform your life. Eileen works with people of all walks of life, other life coaches, heart centered and holistic business people to break free of old negative patterns that keep them stuck. She also specializes in helping creatives ( actors, writers, artists, performers) work through fear, not feeling good enough, self sabotage to acheive a life they love, shine their light and fulfill their life's mission. Contact me to schedule your free Introductory call to learn more about my coaching sessions and ow they can benefit you. When you need help in moving past self doubt, excuses, fear of success, fear of being seen and not feeling good enough to live the life you were born to live. When the "law of attraction" just isn't working. When the goals you try to achieve never manifest. When all the books, prayers, readings and workshops have not brought you any closer to that thing you are missing in your life. 8 one hour sessions every week to help you move past fear and not feeling good enough to live the life you were born to live. Shine your light, because the world needs it. Dismantle the old beliefs, thoughts, and patterns that keep you stuck. I truly believe that in order to make powerful shifts within you and your life, it requires that you stay immersed in the work , supported and reminded of your goals and this 12 week program is a great place to start. 3 Months of weekly calls. Essential when you want new positive behaviors and shifts to last. We will work together to create the life you want. These are the sessions for you when you need to break free from fear, self-doubt, self sabotage to achieve your goals. One 60 minute session offered only to those who have completed the 4 or 12 week Shine Your Light! sessions. “Eileen Anglin is the ideal companion along the light-and-shadow-dappled path of life. She is an exceptional coach and guide to reclaiming the strengths that lurk not just in what we admire but in what we fear. Thanks to her extraordinary coaching skills, I am reclaiming my vision and once again pursuing my purpose and my dream — something I had abandoned in recent years.” ~M.S.